Since her girlhood, Prudence Winship has gazed across the tidal straits from her home in Brooklyn to the city of Manhattan and yearned to bridge the distance. Now, firmly established as the owner of an enormously successful gin distillery she inherited from her father, she can begin to realize her dream. Set in eighteenth-century Brooklyn, this is the beautifully written story of a woman with a vision: a gargantuan construction of timber and masonry to span the East River. With the help of her sisters--high-spirited Tem and silent, uncanny Pearl--Prue fires the imaginations of the people of Brooklyn and New York by promising them easy passage between their two worlds. 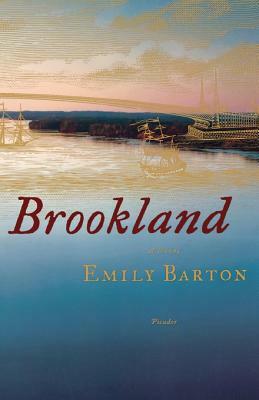 Brookland confirms Emily Barton's reputation as one of the finest writers of her generation, whose work is "blessedly post-ironic, engaging and heartfelt" (Thomas Pynchon). Emily Barton's fiction has appeared in Story, American Short Fiction, and Conjunctions. Her first novel, The Testament of Yves Gundron, called "blessedly post-ironic, engaging, and heartfelt" by Thomas Pynchon, won the Bard Fiction Prize and was named a New York Times Notable Book of the Year. She is the recipient of a 2006 artist's grant from the National Endowment for the Arts and a 2006 fellowship from the Guggenheim Foundation. She lives in Brooklyn, New York.